In this modern world of technology, Ecommerce business is booming day to day. The demand for online purchase is increasing more and more. 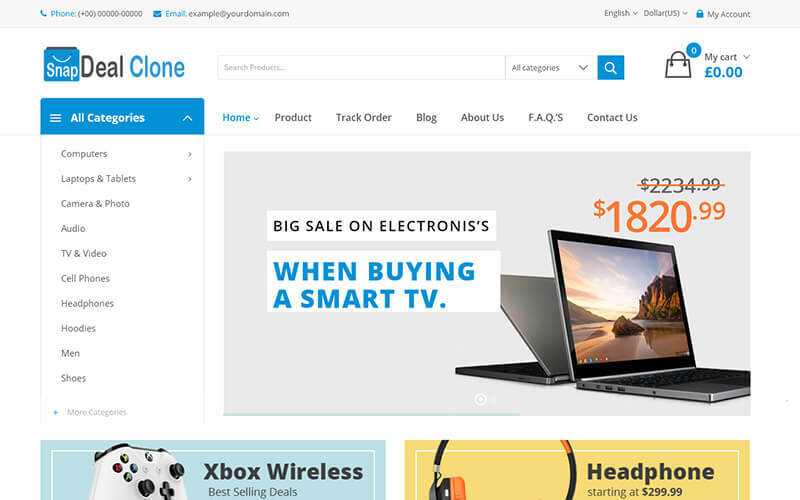 So it’s the right time to start your own online ecommerce website business by using our Flipkart Clone Scriptand earn high profit from the business. Our Snapdeal Cloneis the best choice for entrepreneurs to sell their products online into the global. The peoples can easily buy and sell their products online in our script. The vendor, buyers, and admin have their separate logins. The user login with the valid username and password and can view the various products listed in the category. The user can view various deals with the product details. The visitor can see the products and buy in an easy manner. After that, it will be redirected to the payment process of the product. The payment transaction in our Flipkart Scriptis more safe and secure. The customer can easily track the products and know the shipping details at their fingerprints. The user can compare the various products with each other easily.The vendor can add their products with the detailed information such as name, image, price, features, description, and title in the respective category.Our Snapdeal Scriptsupports unlimited category and subcategory of the products. The main features of our Shopclues Clone Script are secure login, product management, order management, category management, advanced search option, filter option, newsletter, cart, wish list, blog management, CMS management, powerful admin and seller dashboard, social media integration, checkout, track order, stock management, slider settings, blocking features, security scanning, secure code and more on. The admin and seller will get the real-time dashboard to monitor all the stages of sales in the dashboard. Without any technical knowledge the admin can easily handle and manage the location, category, images, products, commission, order and, payment easily.The important advantages of our Snapdeal Clone Script are Mobile responsive and SEO friendly. The revenue model of our Flipkart clone is commission model, banner advertisement, and Google Adsense.Customization of our ecommerce Script is possible according to the clients requirements and business goals. Our ecommerce script is suitable for both small and large scale medium industries.For this script, we provide 1-year technical support, 6 month free updates of the source code and brand free. After purchasing our Shopclues Script, the site will be in next 24 hours. We are the top professional web development company offering a wide range of ecommerce solution to the clients with the cheap price and high satisfaction. Thanks to all for giving these wonderful Scripts… congrats have a great sale!